I haven’t been drinking cow milk for a while now. At least a few months without fail. Prior to that, I had been experimenting with various kinds of dairy milk and non-dairy “milk.” I’ve tried hemp milk, almond milk, hazelnut milk, oat milk, soy milk, rice milk, coconut milk, goat milk… Are there more? I’m probably missing something. I’m lucky to live in Seattle, as I’ve come to find that the green-mindedness that goes on out here tends to lead to a great selection in alternative eating habits. At our local co-op grocery store, I’ve tried pretty much all their milk varieties in partial experiment to see what I like and to vary what I consume, and also in a partial attempt to find something that would be able to replace cow milk for me. Sad. Stupid intolerances. Coconut milk is to date the closest thing for me that compares to cow milk (aside from goat milk which is creamier and more tart). It has the right texture. The flavor is a little lacking in comparison, but it isn’t bad. I don’t feel like I’m suffering and making myself drink coconut milk, denying cow milk. I started by drinking So Delicious Coconut Milk. I’ve tried the Original and the Unsweetened. I think there’s a vanilla flavor too, but I would never try that; I’m not big on vanilla flavored things (thus my protein powder is always chocolate!). I found the unsweetened to be the one lacking in flavor, while the original is just right. However, in an effort to consume less refined sugar, I try to buy the unsweetened. I usually use it in my smoothies where I can’t really tell the sugar is missing. The So Delicious Coconut Milk is usually $4-5/half gallon at the stores near me, which isn’t cheap, but we typically only go through one a week. The price is comparable to all the other alternative milks when comparing the same quantity. My old organic milk was $5-6/gallon though. Although in the end I was drinking raw milk at $7/half gallon, and now I also get goat milk at almost $9/half gallon. To try to cut down the cost, I thought I’d see if I could make my own coconut milk. I have a book that tells you how to make your own from coconut flesh. To start, I decided to use canned coconut milk. I bought a can of Thai Kitchen Organic Coconut Milk (full fat, no low fat for me). I spooned it into a half-gallon Ball jar and then added 8 cups of water. I initially started with 4 cups, but then realized to be competitive with the So Delicious, I’d have to try 8 cups. 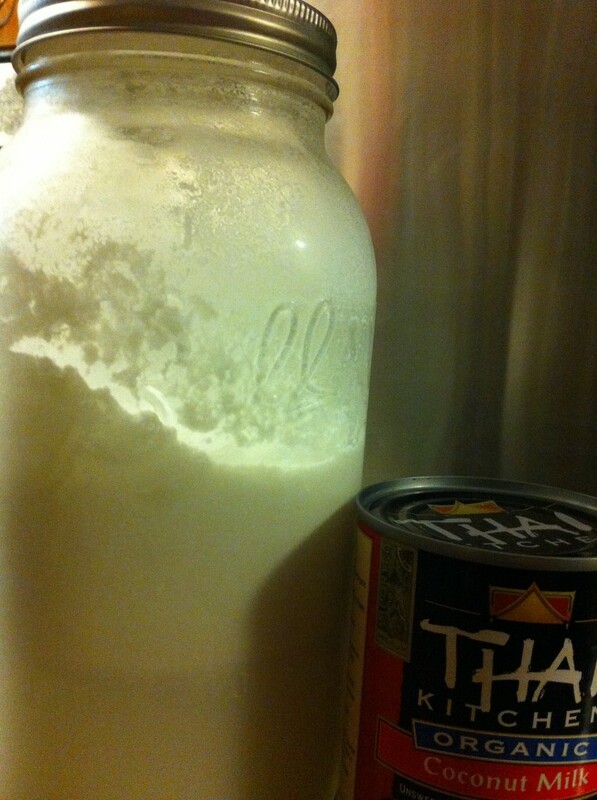 I shook the jar up and then chilled the coconut milk in the fridge. Thus far I’ve used it for smoothies and they’ve tasted the same as So Delicious. I also made oatmeal on the stove using my coconut milk instead of water. That was good. The true test will be a bowl of cereal, except I don’t eat cereal often these days, so that test is yet to come. You can see a faint line where the coconut and water are partially separated. Just shake it up before each use. Has added vitamins and minerals to help those who won’t get calcium et al from dairy milk. Although the homemade has more calories and fat, I don’t necessarily find that a bad thing. I subscribe to a different nutrition outlook than most though. This entry was posted in sustenance+sustainability and tagged beverages, dairy-free, gluten-free on 5 October 2011 by cheryl. Here's to a sparkling day of wonder and inspiration. And if your day goes splat, then here's to admitting defeat with grace and learning how to turn it around tomorrow.